Maintaining ductwork can increase the lifespan of your conditioning system dramatically. This article will focus on maintenance tips and highlight important servicing information. If you have a forced-air conditioning system (many homes in South Australia do), then it will also have a system of ducts to distributing conditioned air to rooms in your home. As the ducting is hidden throughout the house, it’s easy to underestimate the importance of the ducts when it comes to the efficiency and effectiveness of your air conditioning system. In order to keep your home heating and air conditioning system fresh and working strong you will need professional ductwork service technicians in. Our indoor air conditioning specialists at Bigfan Air Conditioning offer duct sealing, repair, modification and replacement that will make sure that your ductwork is working perfectly to maintain excellent circulation of air throughout your home. The wrong placement, sizing and repairs can have a large effect on your comfort and budget in air con installation and they are very good reasons why you need professionals to install your air conditioning system. Placement is very important as ducts opening up in the wrong spot in rooms can mean inferior heating and cooling. Sizing of ducts should be based on the volume of air that moves through them. If ducts are too large there will be weak airflow from vents, hence small ducts will restrict airflow cause damage to the venting system. Leaks in ducts will cause a loss of comfort and noticeable increase in costs. Escaping air will lower air pressure and make it very difficult for the system to cool or heat efficiently. Want to look at the manufacturer range? See Samsung Single Phase Ducted Air Conditioners. 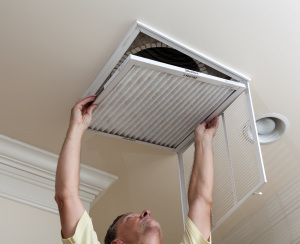 If you have any troubles with your ducted system call our team at Bigfan Air Conditioning.